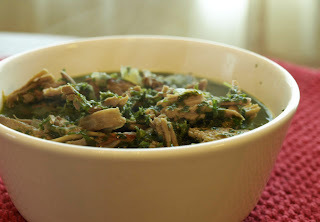 This soup has a rich flavor that is a little different than the other soups on this blog and a nice change. Melt the butter or fat in a heavy-bottomed pan. Saute the onions for several minutes until soft. Add the salt and spices and stir, then add the parsley and stir again. Continue to cook, stirring frequently, for about 5 minutes until the parsley turns dark. Add the meat (if already cooked) and the broth. Bring the soup to a boil, then let it simmer for 15 minutes to heat the meat through and to give the flavors a chance to blend. Add the lemon juice and cook about 5 minutes more. Remove from heat and adjust the seasonings. I like this soup as a way to use leftover meat from a leg or shoulder of lamb. If using raw meat, brown it first in the fat and then remove it to a bowl, cook the onions and parsley in the fat, then return the meat to the soup when you add the broth. Beef may be used instead of lamb if desired. It is traditional to make this stew with beans as well. If you are able to tolerate beans, you can add about 2 cups to the soup. Great recipe - I am a huge fan of lamb, will have to give this a try. I love the herb and spice combination! This looks really delicious. I love lamb with fresh herbs. I made some lamb burgers with mint, oregano and cilantro yesterday and they were yummy. I look forward to trying your soup! Thia look right up my street, will definately give it a go in the next week. If ya ever fancy stopping by! I;ll let you know how I get on when I try this, it'll be a good excuse to use up some parsley in the garden too! I finally was able to give this a try tonite. The spices aren't too far from the marinade we use when doing lamb kabobs. I really liked it! Thanks!